In a Quaker study group I lead, two members voiced differing visceral responses to the parabolic storytelling of Jesus. A koan is a little healing story, a conversation, an image, a fragment of a song. It’s something to keep you company, whatever you are doing…. Koans don’t really explain things. Instead, they show you something by opening a gate. You walk through, and you take the ride. In other words, a parable is something to jog your thinking—precisely because it doesn’t make sense according to conventional views. Parables sneak up on you. My favorite is usually called “The Good Samaritan” (Luke 10:25-37), but most of us miss the point because we just read the story Jesus told the lawyer instead of the story about the lawyer. As I’ve written elsewhere, 4 The lawyer, trying to catch Jesus up, asks, “who is my neighbor?” Jesus tells the parable and asks back, “Which of these three do you think was a neighbor to the man…?” The lawyer answers correctly and then walks off. That stopping at a distance is all that counts. That’s when we start unloading the baggage in the way of really seeing into ourselves. That’s when, maybe, we recognize how the storyteller has laid a booby trap for us…one that we would be happy, if we only knew, to fall into. That’s when we might let go of all preconceptions and, better, let go of all expectations for our own lives. That’s when we might discover that there is no secret. Just a truth that our normal way of looking at things conceals. I have always been wary of either the “right doctrine” of religious orthodoxies or the “secret knowledge” of ancient or modern gnosticisms. My bone-deep conviction, arising from my childhood apprehension of the witness of Jesus, is that every human being has an intimate, unmediated and salutary relationship with what many of us call God. That relationship cannot be one which depends upon living by right doctrine or secret knowledge. It is implicitly familial, a birthright which no human agency can grant or deny. Wherever there seem to be rifts or torments in the relationship, those arise from the misperceptions of human beings, not from the reality of God’s interrelationship with us. This conviction seems to me also to be at the very heart of Quaker faith and practice. When those seekers in seventeenth century England lay aside scripture, liturgy and sacrament to “wait upon the Lord,” it was because they had come to recognize how finite and fallible any forms of human concept and language are when it comes to representing the living Truth of that divine interrelationship. 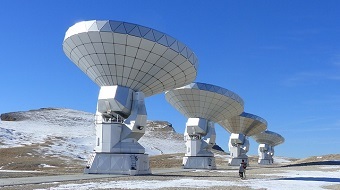 Image: “Bure Peak Antenna,” a parabolic antenna array on Pic de Bure the Dauphiné Alps in France. By claude05alleva (2016) on Pixabay [CC0 Creative Commons, free for commercial use, no attribution required]. Jesus seems to imply that “the secret of the realm of God” has been imparted only with the disciples. Your title implies that this is not the case. Is it their direct acquaintance with Jesus to which he refers and which to others comes through the parables? In the latest session of our study group (see Session 6: Worshiping together), we spoke directly to the difficulty of explaining to others what we experience in the depth of silent worship. Group members took turns describing the physical, emotional, mental, and spiritual sensations they move through during “waiting worship.” But note, we were describing the sensations, not what they evoked inwardly, before concepts and words. In a sense, all Jesus could give the public was parables. You can’t talk about or hear about God’s realm. You have to do it. Then, if you are curious—and spiritually hungry enough—you might sit down with Jesus, center down, and wait.